The Super Mario Bros. Super Show! 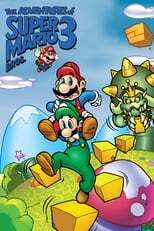 is an American television series based upon Nintendo's Super Mario Bros. and Super Mario Bros. 2 video games. It was originally broadcast via first-run syndication to mostly independent or Fox television stations from September 4, 1989, to December 1, 1989, with reruns continuing until September 6, 1991. The Family Channel picked up the series on September 23, 1991, and aired it until August 26, 1994. The show was produced by DiC Animation and was distributed by Viacom Enterprises in association with Nintendo. DHX Media, the successor company of Cookie Jar Entertainment and DiC, is the current distributor.